The 2015 Sr. PGA Championship at French Lick Resort May 21-24, Tickets at PGA.com. The 2016 Sr. PGA Championship is Back-to-Benton Harbor Michigan and the Golf Club at Harbor Shores. BY: Rory Spears, Editor & Director of Content. Follow Rory on Facebook, Linkedin and Twitter @GogBlogGuy. 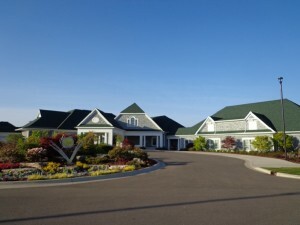 The Golf Club at Harbor Shores Club Clubhouse. It’s a return to the Golf Club at Harbor Shores in Benton Harbor Michigan today for the golf media. Both the club and the PGA of America are anxious to show off some changes to the golf course, and the newly redone greens. They should be in fine shape by the time the Sr. PGA Championship returns to Benton Harbor in May of 2016. The Gog Blog will have more on Harbor Shores coming up in the week. In the meantime Harbor Shores and the new Harbor Shores Hotel are open to the public. Islandhillsgolf.com Island Hills Golf Club Centerville Michigan, Chicago’s Southwest Michigan Golf Destination, A Ray Hearn design. 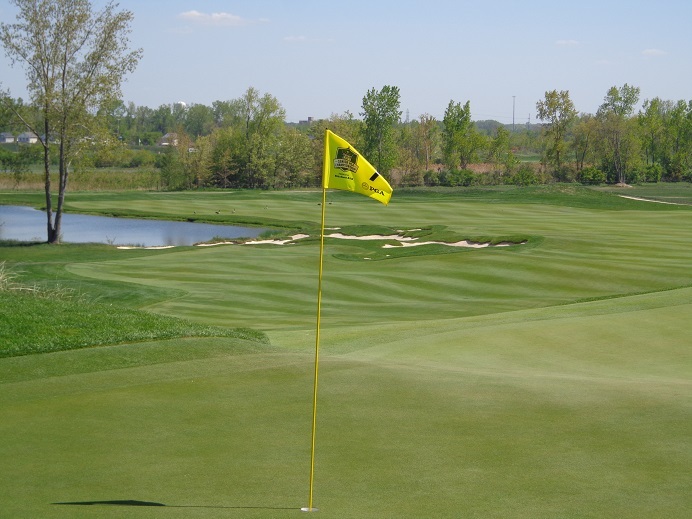 The Golf Club at Harbor Shores is a 90 minute drive from downtown Chicago. It is operated by the Northbrook based Kemper Sports Management. 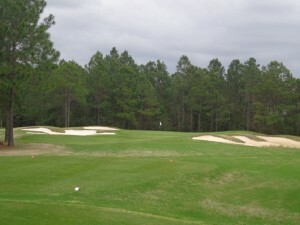 The golf course is a signature Jack Nicklaus design. 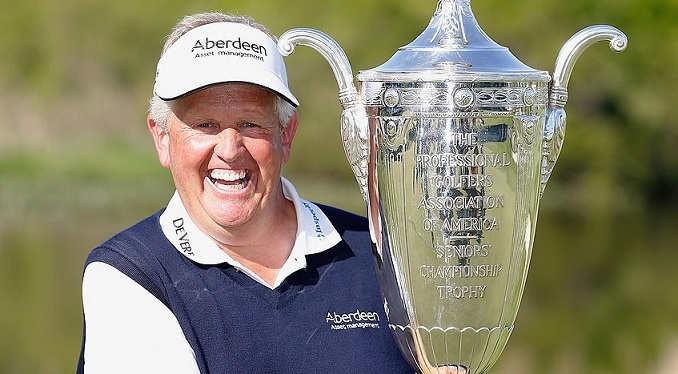 Colin Montgomerie won the 2014 Sr. PGA Championship at Harbor Shores, he is defending his title at the French Lick Resort in just three weeks. Golfers as the warm weather rolls in, be sure to visit Nickluas.com or hit your local supermarket for information on the new seven flavor line of Jack Nicklaus Ice Cream. Winn-Dixie, Bi-Lo and Kroger Food stores. The Glenview Park District Clubhouse is getting a facelift, along with the golf course renovation the facility will look brand new this summer when it reopens. It’s not just a renovation of the golf course, happening over at the Glenview Park District Golf Club. The clubhouse is getting a facelift and being given a more modern look. It’s expected that the clubhouse will be ready to open by the time the golf course does. As of now the park district is hoping to reopen the course from the Libertyville based Rick Jacobson renovation in July. 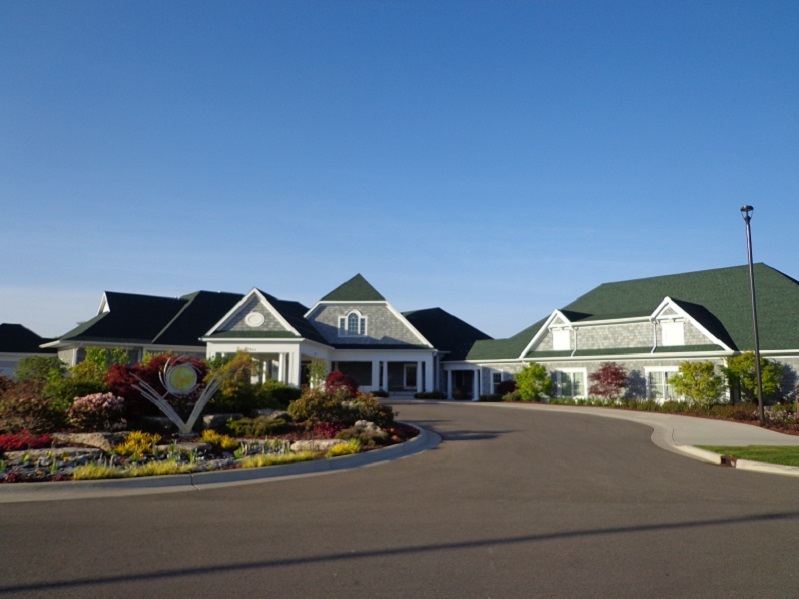 The Point O’Woods Country Club in Benton Harbor Michigan has announced it’s new head golf professional. Point O’Woods has undergone several changes in recent years, both to the golf course and with the building of a new clubhouse and some cottages. For many years Point O’Wood was the host of the Western Amateur until it returned to the Chicago area. The club will again host the amateur in 2019. The Sentry World’s famed par 3, 16th hole the “Flower Hole” is ready for golfers. Coming this Saturday May 2nd the Sentry World Golf Course will open for play to start the 2015 golf season in Stevens Point Wisconsin. The golf course that finally had a soft-opening last fall is now fully ready to go, from the Robert Trent-Jones and Jay Bilasi renovation. 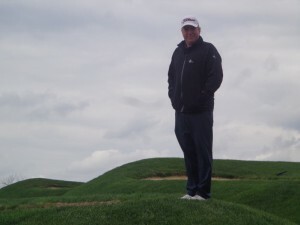 In addition the club has announced that long time head golf professional Brian Dumler will now focus on golf instruction and player development, Dumer the Hoffman Estates native is looking forward to helping both experienced and new players improve and enjoy the game even more. The Gog Blog returns soon, with an update on Harbor Shores and other area golf news. Now Go Play, the weather is warming up. RS. The Sr. PGA Championship at French Lick Resort May 21-24, tickets see PGA.Com Medinah Patriot Day, close to sell out, visit Illinoispatriot.com help Illinois Veterans who help keep us safe. Mt. Prospect Golf Club returning from renovation August 1st. Stan Utley former PGA Tour player, current Putting Guru and Short Game Specialist, shows the Only Green at The Glen Club. The art of practice putting and putting aids has changed over the years. While some golfers might still use a plastic cup with a metal pad, that runs on battery and returns the ball to you after putting, there are now new options that take practice putting a few steps further. How about an expansive putting surface, that is covered with a surface that feels more like really grass. Something that is easy to set up, and allows for an easy adjustable surface so you can the undulations you will find on the greens at your local golf course. If you want faster putts rolling 12 on the stimpmeter, or something against the grain that leaves the speed in single digits. Well no there is “The Only Green” by Brunswick and now available for purchase to use in your home, office, country club, or at your special event. There are multiple hardwood finishes so the wood grain fits with the rest of the room, there are six types to choose from. The Only Green can be snapped together and does not require any tools to be assembled. The Only Green, shown here the Ross Model. The designers decided to honor the great architects of the game, as they created different versions of the Only Green. The Ross Model is 2’x8′, The Maxwell is 3’x9′, The Old Tom is 3’x12′, The MacDonald 4’x12′, The Tillinghast 4’x16′, The Mackenzie is 4’x20′. Tim Ummel the Co-Founder and Managing Partner of the Golf Tank in Scottsdale Arizona, spoke about The Only Green. There are multiple ways to see and or purchase The Only Green. You can visit online Brunswickbilliards.com or Leisurefitness.com/TheOnlyGreen. In the Chicago area you can see them at the Great Escape Stores. Currently the only Great Escape stores with product in stock as of this date, are located in Skokie and Algonquin. The backboard of the Only Greens can have your name inscribed, or that of your business. Perfect for use at the office or corporate events. So why not putt the best you can when you reach the golf course, keep your silky putting stroke solid all winter long, try the Only Green now in your local stores. Medinah Patriot Day May 26th at Medinah Country Club, Help Illinois Veterans See Illinoispatriot.org. The Sr. PGA Championship at French Lick Resort May 21-24,tickets at PGA.com. Mt. Prospect Golf Club Reopens August 1st. The Forest Preserve District of DuPage County Board of Commissioners, has awarded a construction contract for the renovation of the Oak Meadows Golf Preserve in Addison. A renovation project will begin on July 6th, to help create a flood-resistant golf operation and to create a natural habitat and to improve flooding control along Salt Creek that runs through the property. Ed Stevenson at WSBC AM 1240 & WCFJ AM 1470 home of Golfers on Golf Radio, is the Director of Golf Enterprises at the District. “This plan for Oak Meadows was borne out of a desire to challenge the assumption that any efforts to protect the golf operations from flooding would simultaneously reduce the property’s usefulness for stormwater management,” said Ed Stevenson,director of Golf Enterprises for the district. The 288 acre project has been awarded to Martam Construction Inc. of Elgin,to create an 18 hole par-72 course with tee options that range from 4,800 yards to 7,100 yards and to expand the practice area’s. Part of the master plan is to elevate some of the playing surfaces to limit damage from frequent flooding. This project will include all 27 holes that currently comprise the Oak Meadows golf complex. Construction will begin on July 6th, one day after the course will close for the golf season in 2015, Oak Meadows is expected to reopen in 2017. 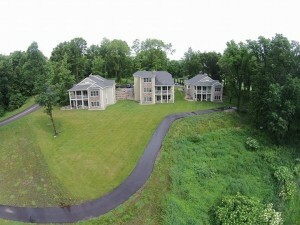 Batavia based architect Greg Martin is heading up a national team of architects to complete this special project. The renovation project will increase the stormwater capacity to the property by more than 20 million gallons, and create 25 acres of new wetlands and 43 acres of riparian habitat. It will restore 13 acres of corridor along Salt Creek, that has suffered from erosion from poor water quality and limited plant and animal diversity. “The District is proud is proud to be at the forefront of sustainable environmental management practices by providing an engaging golf experience while restoring wetlands and natural habitat to the benefit of our residents and guests,” said Forest Preserve District of Dupage County President Joe Cantore. The DCFPD is celebrating it’s 100th year. Come and enjoy all it has to offer. Watch for more details about special events at Oak Meadows before it closes for the season. See Dupagegolf.com for more information on golf. Islandhillsgolf.com Centreville Michigan, Chicago’s Southwest Michigan Golf Destination, some of the best villa’s in the Midwest. Under 2 hours from Chicago. It might take a few more days but warmer weather is coming, but in spite of bad weather this past week I have seen plenty of golfers out playing the area’s golf courses. If your like me and have played all or most of your golf in 2015 on the road and out of town, your anxious to tee it up here in Illinois. I know I am. In a few cases there are some courses that will be closing early this year, to start renovations. If you would like to play Arlington Lakes Golf Club you need to do it by June 7th before a Mike Benkusky renovation will start and close the course until spring of 2016. Returning to play August 1st. The same situation will be happening at Oak Meadows Golf Club in Addison as Greg Martin and his team prepare to start work on July 6th. The last day of play at Oak Meadows will be July 5th. Director of Golf Operations for the Dupage County Forest Preserve District Ed Stevenson, and host of Golfers on Golf Radio spoke about the start of the renovation this July. But there is plenty of time to still go play the historic course before the shutdown goes into effect in July. Oak Meadows is expected to reopen in spring on 2017. 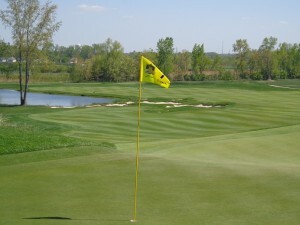 Oak Meadows will close on July 6th, details at Dupagegolf.com. The Gog Blog will have a story coming up this week about renovation of Oak Meadows. As the golf season heads into May, we draw closer to the reopening of the Glenview Park District Course. That is expected to be in July, the Mt. Prospect Golf Club is expected to open around August 1st. However if Mother Nature allows for good weather over the next few months, the hope is to open in July. HashTag-GrowingGrass. The Sr. PGA Championship at French Lick Resort May 21-24, See PGA.com for tickets. Coming up later this week the media day tour visits the Golf Club at Harbor Shores, that has done some course improvements and re-grassed the greens. A full update will be posted later in the week. Coming up on Saturday is the famed Spring Scramble at Shepherds Crook in Zion. The weather could be in the 70’s if the weatherman are correct, always a fun event Shepherdscrook.org for more details. All of the area courses are now open that are not under renovation, including Mistwood that has ongoing construction on it’s new clubhouse. The hope is to open the clubhouse by late August. Visit Illinoispatriot.org for details, support Illinois veterans. 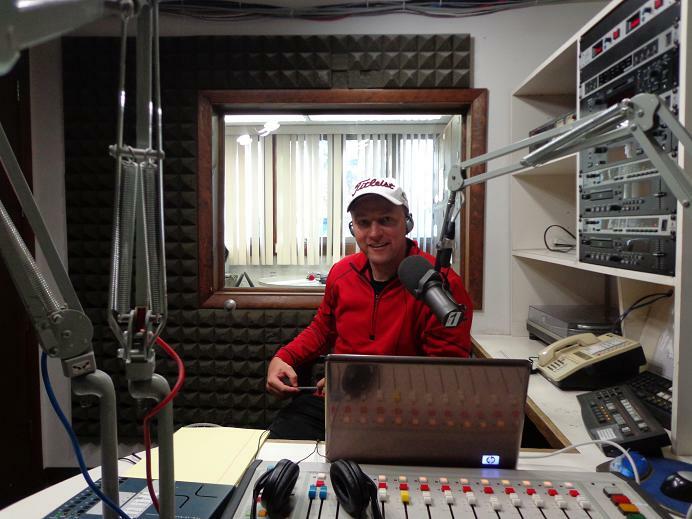 Golfers on Golf Radio week #3 next Sunday at 9AM on WSBC AM 1240, and WCFJ AM 1470 will talk with some of our sponsors and what’s going on around town. As the weather improves I hope you will head out to your favorite courses and tee it up. By next weekend the new issue of Chicagoland Golf should be hitting your pro shop or your local golf retail store. My column about course closings and openings creating a shortage of tee-times will be in there. I’ll also have a recap about my trip to see Golf in the Gulf, a visit to Biloxi Mississippi an emerging golf and gaming destination. Kudo’s to the Mens’ Illinois Golf Team on their Sixth Big Ten Title in Seven years. Lead by Freshman Nick Hardy of Northbrook, the Illini ran away in round three and opened up a 32 shot leaded heading into yesterday final round. Mike Small deserves the credit for building a winner in Champaign. No longer can it be said that a northern winter college golf program, can’t be a power on the national scene. Next up for Illinois will be the regional’s, before the NCAA National Championship’s. For those of you who need golf equipment and live in the city, a new Golfsmith Store has opened in the downtown on Roosevelt Road. Islandhillsgolf.com Centreville Michigan, Chicago’s Sourthwest Michigan Golf Destination, See VisitMississippi.com Golf Biloxi, a new golf destination. 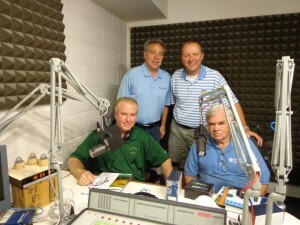 Golfers on Golf Radio 9 AM on WSBC AM 1240 & WCFJ AM 1470, Chicago’s Favorite Foursome is back. Mike Munro, Ed Stevenson, Bill Berger, and Rory Spears. The 8th Hole at Shell Landing in Mississippi. Kenny Hughes the GM of Shell Landing, a Davis Love III course, that had a lot of influence from Bob Spence the former head professional at Kemper Lakes. Hughes will join the program around 9:10 AM, and that will set the stage for our second guest from the Jerry Pate designed golf course The Preserve, Stephen Miles the Director of Golf Operations around 9:25. The Par 3, 16th a No.1 Handicap Hole at the Preserve. Mississippi is quickly becoming a golf destination, especially near the coastline around Biloxi. Where a recent visit found several great golf courses. 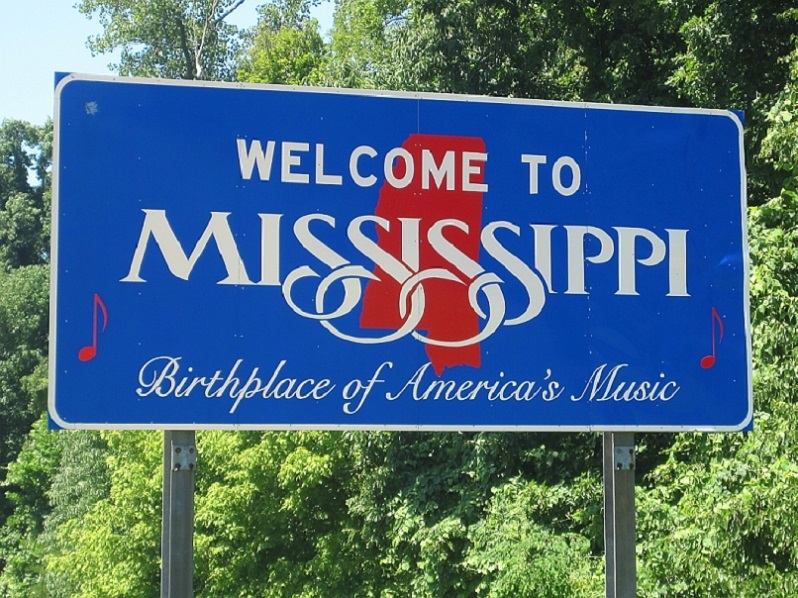 The state of Mississippi might not be looked upon like some of the other southern states in terms of a golf destination, but their are plenty of great golf courses to play and some nice hotels to stay at while playing. With all of the hotel casino’s in the Biloxi area, there is plenty of action on and off the golf course. ILLINOIS has surged to the lead at the Big Ten Golf Championships, what was a four shot lead over Iowa late in round two is now 32 shots after round three. Freshman Nick Hardy went out and set the pace with a 4 under par 68. Thomas Detry had a -1 (71), Charlie Danielson carded and even par 72, Senior Brian Campbell responded from a poor second round of 78, with a 3 under par 69. Dylan Meyer shot 75 and is now +2 for the championship. The battle now seems to be for second place, Illinois is looking to win it’s sixth Big Ten Title in seven years. Links Capital Advisors has listed Milwaukee’s Finest Daily Fee golf course, The Bog in Saukville Wisconsin is for sale with an asking price of $3.5 million. 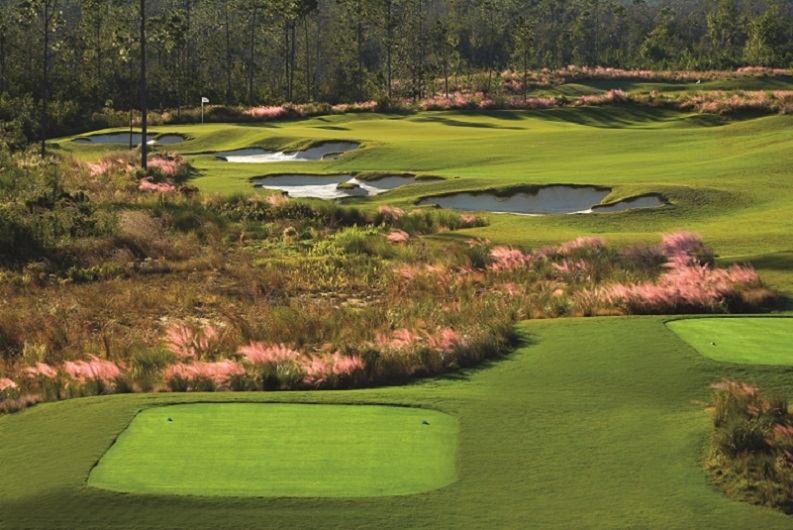 The Bog is an Arnold Palmer Signature course that opened in 1995. The course is Par 72 and plays from 5,110 yards up to 7,221 yards. For more information on buying the golf course, Contact Chris Charnas at (847)-866-7192 or via email at chris@linkscapitaladvisors.com. 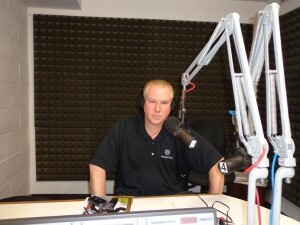 JOIN US THIS MORNING on Golfers on Golf Radio (773)-792-1240. 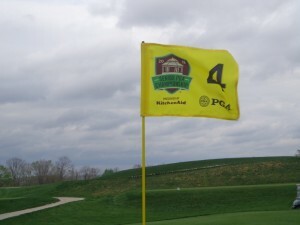 SR. PGA Championship May 21-24 at French Lick Resort, tickets at PGA.com. The Illinois Patriot Media Day May 26th at Medinah Country Club, space is limited. Visit Illinoispatriot.org. Cog Hill Outdoor Demo Day Saturday April 25th. The Illinois Men’s Golf Team is off to a good start as it looks for it’s sixth Big Ten Championship in seven years. The first day of the championship that is now being contested at Victoria National Country Club in Newburgh Indiana, was intended to be 36 holes. But due to a two hour frost delay the second round of 18 holes was not completed. Most of the golfers were near completion, with those remaining on the course having only one or two holes to play. When the horn sounded to stop play for the day, Illinois was at 13 under par and held a four shot lead over Iowa. Illinois scores were the following. The team was lead by Freshman Nick Hardy who completed all 36 holes with scores of 71-69 and is -4, he is T-3. Thomas Detry 71 and -1 through 15 holes in round two is -2 and T-5. Detry is tied for fifth place with Illinois teammate Dylan Meyer who carded 72 and -2 through 17 holes in round two -2 overall. Charlie Danielson 74, -3 through 16 holes in round two is -1 overall and T-8. Senior Brian Campbell opened with a two under par 70, but has struggled in round two and is five over par through 17 and +3 for the tournament, he is T-27. Tee-times to complete round 2 will start at 8 AM today EST, and the third round will start at 9 Am. Final round tee-times on Sunday will begin at 8 Am. The Victoria National course designed by Tom Fazio, is playing to a yardage of 7,124 and to a par of 72 for the tournament. Illinois entered the tournament as the highest ranked team in the country at No.2 in the Golfweek rankings, and No.4 in the rankings of Golfstat. Iowa is ranked 44th and Michigan is 49th. Northwestern that is ranked 72nd, is in 5th place. At the Big Ten Women’s Championship, Illinois is in 9th place after day 1. The Sr. PGA Championship, May 22-24 at French Lick Resort, The Palmer Cup at Rich Harvest Farms June 12-14, Illinois Patriot Education Fund Day May 26th at Medinah. Coghillgolf.com Demo Day this Saturday starts at 9 AM. The indoor demo days at the Chicago area golf domes are over, it’s time for the biggest one in town to take main stage, or maybe main range. Rain or Shine this Saturday at Cog Hill demo day moves outside. From 9 Am to 3 Pm this Saturday April 25th you can attend demo day and admission is FREE. Are you ready to buy new clubs, are you thinking you are ready to buy new clubs. Do you need to see first hand how newer clubs are hitting the ball further and straighter than the five year old clubs you have in the bag. If your ready for a new driver, irons, hybrids, wedges or putters, this Saturday Cog Hill in Lemont is the place to be. What clubs do you want to see, what clubs do you want to hit and for FREE. Under the eye of club fitters and experts. Here are the options your have. Companies expected to be in attendance include, Adams, Bettinardi, Callaway, Cleveland/Srixon, Cobra/Puma, Mizuno, Nike, Ping, Super Speed Golf, Taylor Made, The Iron Factory, Titleist, Tour Edge and Wilson. You have access to launch monitors. Need more, there are raffle prizes, learning center sidewalk sales, club trade ups and trade in options. Iron sets up to $100, loose Woods and Hybrids up to $50. This Saturday at Cog Hill on Archer Avenue in Lemont, 9-3 PM. Get new clubs and go play some golf at Cog Hill. All on the same day and book your spring tune up golf lesson while you are there. Cog Hill’s professionals are nearby or on the back of the range in the teaching area by the barn. 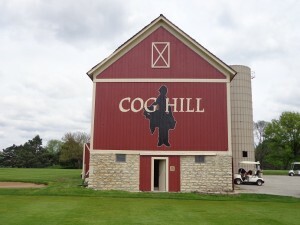 Coghillgolf.com or call (866)-COG-HILL for more information. 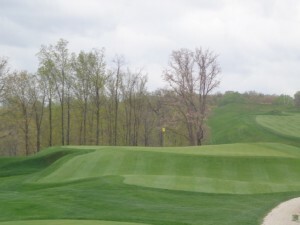 The 2015 Sr. PGA on the Pete Dye Course at French Lick Resort coming up May 22-24, tickets at srpgachampionship.com. Medinah Patriot Day May 26th, help Illinois Veterans, The Palmer Cup at Rich Harvest Farms June 12-14, admission is free. The entrance to the 2015 Sr. PGA Championship. 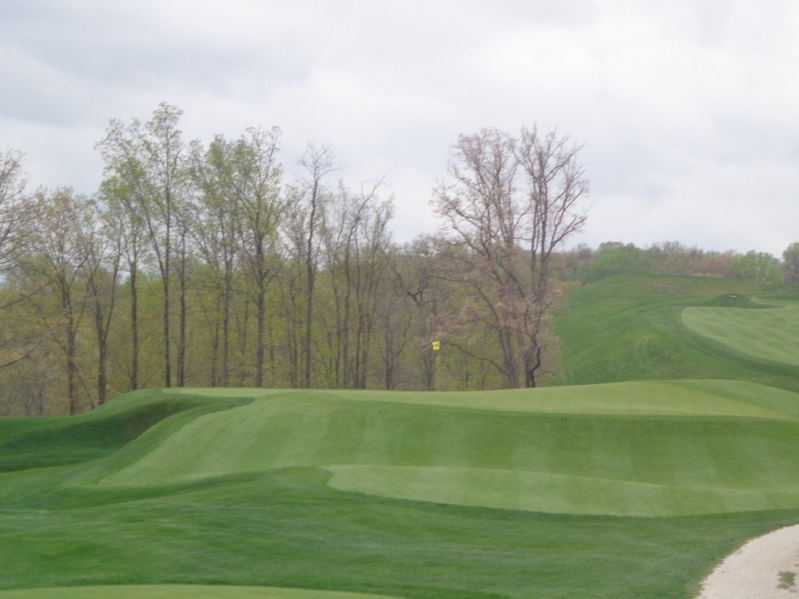 With less than 30 days left until the first tee shot is struck at the 2015 Sr. PGA Championship, the French Lick Resort is kicking into high gear. Defending Sr. PGA Champion Colin Montgomerie attended media day on Monday and came away impressed with how well his playing partners played. Say what ! Yes he said that, but added that he likes the golf course and it should play well for his game. He desperately wants to walk into The Golf Club at Harbor Shores in 2016, still carrying the Sr. PGA Championship trophy. “Monty” received gifts from several Indiana Sports teams, including sweat pants from the Indiana University basketball team. Montgomerie spoke about how much his two senior major titles he won last year mean to him ( won Sr. U.S. Open as well). Montgomerie had fun telling stories from the tour and some of his history from over the years, that includes five runner-up finishes in majors while playing on the PGA Tour. He even says that as he drives between some of his tournaments, he stops for a bite at both Wendy’s and McDonalds. 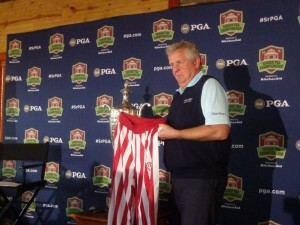 When asked about the Ryder Cup, Montgomerie takes pride in never losing a singles match, then of course quickly apologized to the mostly American audience at French Lick on Monday. He earned laughter from all in attendance for that one. The Par 3, 13th hole, that will play as number 4 during the championship. Neither Montgomerie or any players in the field will be laughing if they miss the fairways tournament week. The rough is already deep, and if it’s not cut before the championship more that golf balls could disappear. One thing the players should like is the options they will get around the greens. Many of the green complexes have chipping area’s around them. Putting from off the green couple be a play the players could use on many occasions, the area several area’s that area very much Pinehurst No.2 like. Pete Dye’s Volcano Bunkers on the second hole of the Pete Dye Course. A unique feature on the Pete Dye Course is found on the second hole, where golfers on occasion will stray into the Volcano Bunkers. Your senior professionals are not likely to be in them, of course if they do land in one they should be able to get right out of them with no problem. As legend has it, a few years ago when Dye was riding around the golf course, someone asked him about older players being able to get out of them. Dye jumped up and ran out of the cart and walked into one of the Volcano’s, and then ran back down. Dye decided if he (then in his mid-80’s) could get out of them anyone else could too. Dye’s logic, was that nobody older than him would be out there playing the golf course anyway. By the time the day was over, Montgomerie was on his way to Branson to play in another Champions Tour event. He departed French Lick hoping for warmer weather in four weeks when the championship is played. It’s likely he will get just that. The Gog Blog by Rory Spears, Editor & Director of Content. Follow Rory on Facebook, Linkedin and Twitter @GogBlogGuy. Before it gets too late, are you ready to get tickets, visit Pga.com/srpga. or call (800)-PGA-GOLF. The Senior PGA Championship at French Lick Resort, a major title on the line on Memorial Day weekend in Indiana. 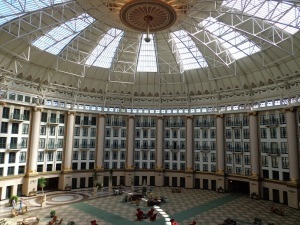 To visit French Lick Resort see Frenchlick.com. Golf, Casino, Spa, great food, two hotels and more. 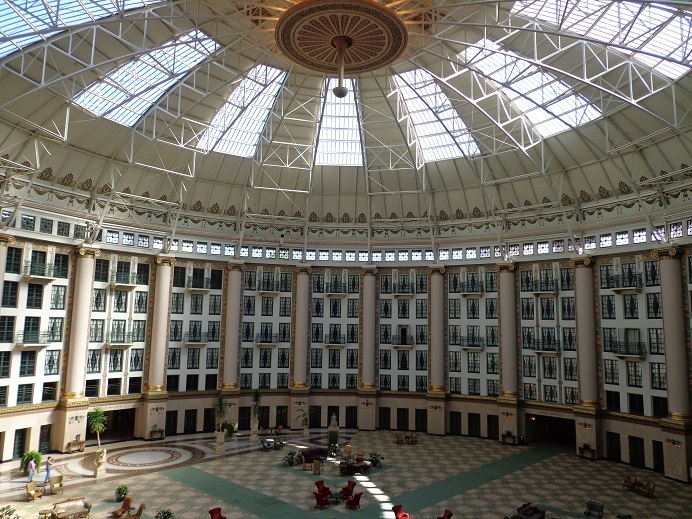 French Lick Resort is home to the LPGA Legends Championship. Montgomerie after his press conference did confirm that he will not play in the Encompass Championship in Glenview come July, due to a conflict with him playing in the Scottish Open that very same week. The Palmer Cup June 12-13-14 at Rich Harvest Farms in Sugar Grove, Medinah Patriot Day is May 26th, See Illinoispatriot.org. The Squeeze now in theaters, including the AMC theater in Skokie. Frenchlick.com The West Baden Hotel. The Senior PGA Championship is just about a month away, this year it tee’s off at the French Lick Resort in French Lick Indiana. 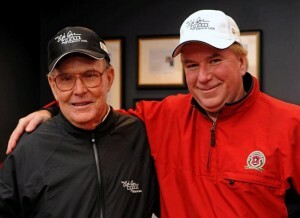 The championship will be played on the Pete Dye Course, that was designed by you guessed it, Pete Dye. 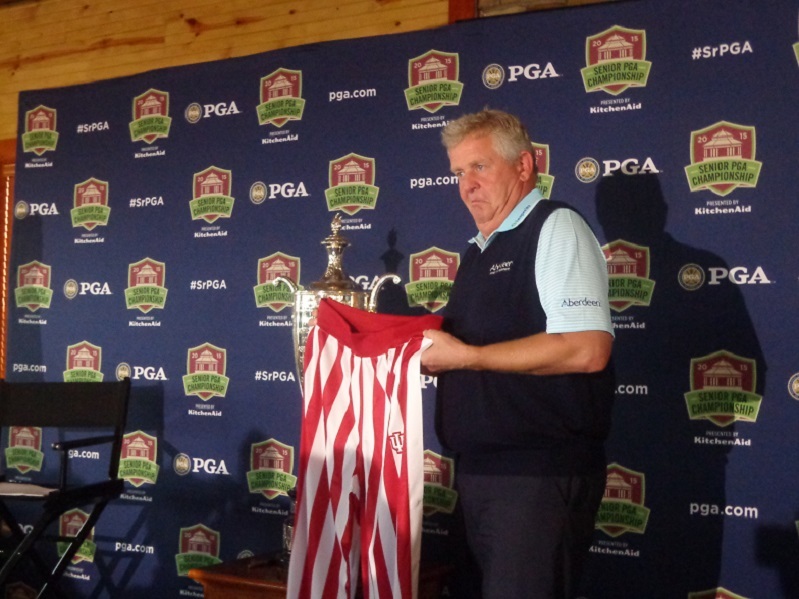 Last year at Harbor Shores Golf Club in Benton Harbor, Colin Montgomerie was the champion, and he will defend his title at French Lick. One sure way to know that golf season is coming is the planning of golf media days. It’s where the defending champion of the tournament comes and speaks, and media members get all the details of what needs to be passed out to the fans, or patrons when discussing the Masters Tournament. The Senior PGA Championship at French Lick Resort. It’s a chance to see the golf course and what has been to test the professionals when they arrive to play. Information tickets and charities benefiting from the championship. If you need corporate hospitality this is where the information comes out. Final head counts on volunteers needed and more. Monty will sit fireside and talk with media about his hopes to repeat on the challenging Pete Dye course and what it might take to win again in 2015. PGA officials will fill us in on what (you) we need to know. YES, media days it’s really the start of golf season when they start to appear on the calendar. While the Dye Course will closed for the tournament around Memorial Day weekend, it is open the rest of golf season for your enjoyment. 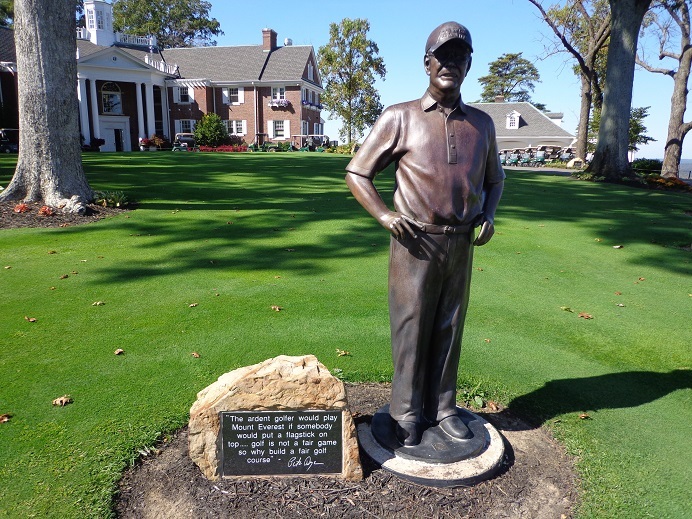 Visit French Lick Resort and play the Pete Dye Course, The Donald Ross Course and the Tom Bendelow Course. The spa and casino await you as well. The famed Pete Dye Statue in front of the Dye Clubhouse, the opening hole (L) on the Dye Course with other front nine holes (R). Golfers on Golf Radio, they are back, Chicago’s Favorite Foursome standing L-R Mike Munro & Ed Stevenson, seated L-R Rory Spears & Bill Berger. It came up so quickly that week 1 of 23 is the cup, and we are on to the next hole. We are working with a new producer this year Mike Mercado, who might last all 18 holes if we don’t drive him nuts first. We’re putting everything back together for a great run of golf talk this year. Next week Mike Munro might even join us, in fact we know he will. Mike might not have a dome anymore, but he is still one busy golf guy. Next week more information on tournament No.1 the Sr. PGA Championship, and a recap of my visit to the Biloxi Mississippi area. 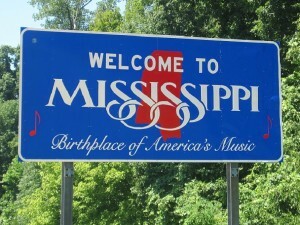 Biloxi a new golf destination that you will enjoy. Golfersongolf.com is written by Rory Spears, Editor & Director Content, Follow Rory on Facebook, Linkedin, & Twitter @GogBlogGuy. This past week I traveled to Kohler to do some advance work on the PGA Championship coming this August. I found the Irish Course and the original Blackwolf Run course are open for play, But by the weekend Whistling Straits and the full River Course and Meadow Valley Course will be open. The Kohler beer festival is coming up and that is one party you don’t want to miss. Taste test them all, and there are plenty to try. The beer festival outing is always fun to play in. 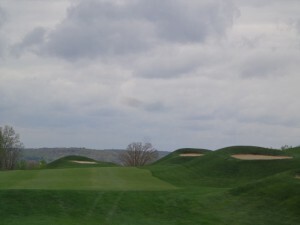 Other great events in front of the PGA Championship headed Kohlers way, see DestinationKohler.com for more details. THE ONLY GREEN, is coming you way. Need to work on your putting at home or at the office, need something fun for a corporate event, well the Only Green might be what you need. The wood grain finished product is coming to Great Escape stores around the Chicago area, more coming up this week. The Gog Blog returns this week with more on the Only Green, and other golf news. Until then, the courses have opened GO PLAY. Medinah Patriot Day May 26th is coming soon, visit Illinoispatriot.com and register your foursome today before this event sells out again. Golfers on Golf Radio returns Sunday April 19th at 9 AM on WSBC AM & 1240-WCFJ AM 1470. Join Chicago’s Favorite Foursome Mike Munro, Ed Stevenson, Bill Berger and Rory Spears for the launch of the show’s 20th season. The 19th Palmer Cup will be played at Rich Harvest Farms in Sugar Grove Illinois on June 12th, 13th and 14th. Currently the United States leads the all-time series over Europe by a 9-8-1 total. Earlier this year the coaches for the two teams were announced. For the United States Bruce Heppler the current head coach at Georgia Tech University, while Jean Van de Velde from France was named the head coach for Europe. The Palmer Cup, A tribute to the legacy of Arnold Palmer. This past Friday the teams for both Europe and the United States were announced. At that time the assistant coaches for both teams were also announced. For Team USA it is Chris Hill from the University of the Pacific,and for Europe it is Janice Moodie from Scotland. Moodie played for Team Europe in the 2009 Solheim Cup won by the United States when it was played at Rich Harvest Farms. Players selected by rankings. Lee McCoy-Georgia, Maverick McNealy-Stanford, Hunter Steward-Vanderbilt, Robby Shelton-Alabama, Jack Maguire-Florida State,and Beau Hossler-Texas. Committee Selections: Kyle Jones-Baylor, Ollie Schniederjans-Georgia Tech. Non-Division 1 Selection-Carr Vernon, CSU Monterey Bay, Coach Bruce Hepplers Pick-Anders Anderson, Georgia Tech. Players selected by rankings. Jon Rahm-Spain, Max Rottluff-Germany, Rowin Caron-Netherlands, Adrian Meronk-Poland, Clement Sordet-France, Thomas Detry-Belgium. Committee Selections, Gary Hurley-Ireland, Mattias Schwab-Austria, R&A Foundation Scholars Tournament, Mattias Eggenberger-Liechtenstein, Coach Van de Velde’s Pick Pep Angles-Spain. The matches begin on Friday June 12th at Rich Harvest Farms. Admission and parking are free on all three days. Spectators are allowed to walk the fairwayswith the players during the tournament. For more information please visit palmercup.org or see richarvestfarms.com. The Palmer Cup is the first major amateur event at Rich Harvest Farms this summer, the second will be the Western Amateur that will be conducted the first week of August. Rich Harvest Farms will host the 2016 LPGA International Crown in July 2016, and in 2017 will be home to the NCAA Division 1 Golf Championships.